Babesia spp. are intracellular parasites of red blood cells and cause the disease babesiosis. A number of species have been identified that infect humans and other animals. B. microti is the species most often infecting humans. The parasite produces ring forms that resemble Plasmodium sp., the causative agent of malaria. Only the ring forms of Babesia are seen in human infections. 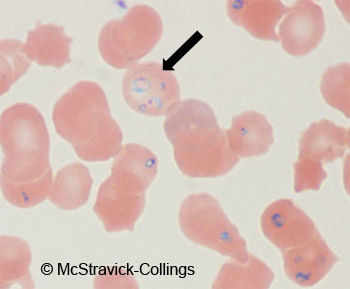 It is not uncommon to see multiple ring forms inside a single red blood cell (arrow). Because the treatments are different for babesiosis and malaria, it is important to distinguish the two diseases.